Geothermal pumps extract from the land and water stored solar energy and then transfer it to the home circuit. This idea is not new. The theory was developed in 1852 by Lord Kelvin, however, became widely used only at the end of the 20th century. Spending 1 kW of electricity – you can get from 2 to 6 kW of heat. Such installation use energy not for the production of heat energy, but on its transfer. The highest output can be reached at a temperature in the heating circuit of up to +35 degrees. These installations perfectly combine with warm water floors. Any environment outside the premises, where the winter temperature is above 0 degrees, can be a source of heat. It can be a non-freezing reservoir, river, well with a sufficient amount of water or other in ground sources. 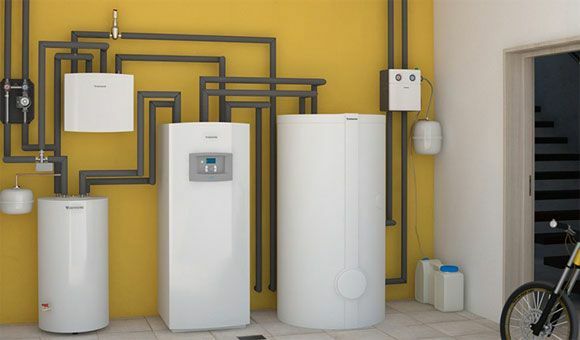 The principle of operation of a geothermal heat pump is that the heat from the sources transferred to the installation, converting and transferring it to the heating circuit. The pipeline with a large extent laid in a warm environment. The pipeline is locked out, the pump provides the motion. The heat carrier heats up to ambient temperature – + 5 degrees. Passing through the first heat exchanger, it gives off heat to the refrigerant. Freon used as a refrigerant. In a liquid state it enables to perform the installation. As the heat comes from the sources, its temperature gradually increases and changes to a gaseous state. Then it enters the compressor, where it is compressed and a large amount of heat released. Gas leaves the compressor with a temperature of 35 to 65 degrees. Entering the condenser, it transfers thermal energy to the coolant, which is fed to the circuit. Freon itself enters the waste valve. The sharp drop in pressure occurs and freon is cooled and liquefied again, then it flows back to the evaporator, where a new cycle begins. Giving up the use of gas as the main source of energy. The problem of gas prices disappears. Due to the low caloric content of the gas the costs rise and the capacity of gas boilers decreases. Eliminates the question of connecting a house to gas and building a firebox with complicated norms, the question of installing chimneys disappears. The overall safety of the people who live in the house is increasing. There is no need for the boiler maintenance. Provision of residents with warm and hot water, and cooling in summer. High efficiency and special tariffs for the electric power allow to bring expenses to a minimum. Reliable performance with constant power characteristics. The service life of the compressor – 30 years.